All organizational matters of the Director’s office, preparation and follow-up of the BICC Board meetings (Supervisory Board, Board of Trustees and International Board), organizational matters of BICC’s international conferences). Susanne holds a diploma as Translator for English and Spanish from the Cologne University of Applied Sciences. 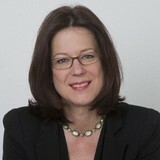 Before she came to BICC, she worked with a German-US science-promoting foundation and an international computer consulting company.